50th anniversary owners manual kit arrived! The UPS guy stopped in front of my house, then started to drive off. I quickly ran outside and asked him if he had a package for me from Ford Racing. They had the address off by one making it an even number address. We have no even number address because all the houses are on the odd number side of the street. I caught him though and got my package!!! Always nice to get stuff like this after the deal is done. Spread it all out and take a pic so we can see all the goodies!!! Was your USB Charger Case in Shrink Wrap? Last edited by LQQK; 9/11/15 at 07:26 AM. Contact Ford and ask for another one? I did...waiting for a solution from them. I had the same thing happen to my owners kit that was sent down to S.C. but not quite as bad as yours. I have not contacted Ford for a replacement yet but maybe I should? Any idea if Ford will issue these same kits for the Canadian cars as I had an Anniversary car delivered in January? Wow - are these being sent out to everyone who bought a 50th Anniversary Edition? If so - how long after you bought your car did it show up? is there some where to contact to get the rest ? It's been almost 30 days since we bought our LE. I wonder how long it will take for us to get ours. We did finally get our owners kits a couple weeks ago. Very nice. Bigger than I expected. do you have the return address, UPS returned mine, now it vanished, thanks! where did u buy it?? 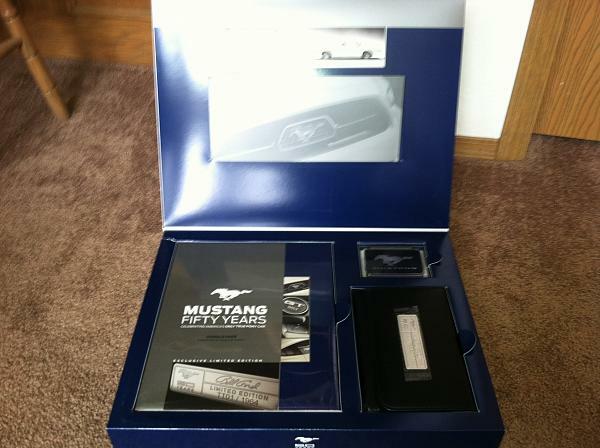 i bought 50th anniversary mustang which unfortunately did not come with the owners manuals or the package that it comes with like tag number and certificate so i need to order one and dont have any idea where to order from. if you can help me will be greatly appreciated. Where did everyone go? I'm #2 in the ownership line for my LE and just PM'd Deysha who I hope is still an active account as I'd like to get the owners kit if any still exist. I didn't get the temporary delivery cover either but have since ordered a clear view indoor cover which is more usable. Quick Reply: 50th anniversary owners manual kit arrived!